chances at winning immediately, because it meant that his 14th place qualifying effort would go to waste and he would have to start in the back. Fortunately the #11 Team had a driver behind the wheel who wheeled the car up to 5th place before fuel strategy and bad calls on adjustments would mirror him to the back. Denny short pitted with alot of other carse to ensure he would have enough fuel for the end. Right before Denny pitted he demanded that they make a change to the car, because it was wicked tight. Mike made a small air pressure adjustment, while most other cars where taking a swing at it with track bar adjustments, including race winner Paul Menard. Denny got to tight and started to fall back even more. To compound the issue, most of the cars in front of him that didn’t pit, still made it on fuel. The FedEx team didn’t get the finish they deserved today. Luckily they’re headed off to Pocono; Denny’s best track, where they can get their redemption. 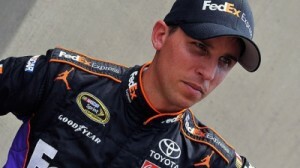 That was really disappointing to see, Hamlin was doing great before, was running top 10! Tough day overall for the JGR boys I would say.